I graduated from college thirty years ago, and twice a year, every year since, I’ve been sent a request to submit a precis about how my life is going to the “Class Notes” section of its Alumni Review. I could say I haven’t responded because I could never find stamps during the first decade, didn’t do the internet the second, and took the whole third to master the “flagging” option on e-mail messages, but (and I’m pretty sure you saw this coming), I’d be lying. I’ve never responded for the same reason I’ve never gone to a reunion, or the hundreds of alumni social events that take place in small and large cities across the U.S.: I didn’t create deep friendships in college. I liked many of my fellow students, and loved my idea of plenty of others. I shared laughs, interesting conversations, classes, team locker rooms, political events, and parties with this and that person. My poor hook-up choices and drunken excesses were in the normal range. But as graduation approached, it became clear that something somehow had gone terribly wrong. I hadn’t made a solid circle of college buddies. I hadn’t even managed a nice minimalist triangle. 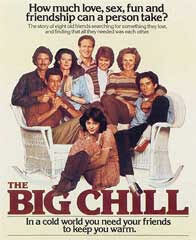 Dropped off for my first year of college the month The Big Chill was released, I knew how things were supposed to go. Dancing to its soundtrack for four years alchemized the theory into certitude. By the time of graduation, I should have been part of a tightly bonded coterie of six or seven people who had grown close through shared adventures, mishaps, a series of attempted pairings, misunderstandings, make-ups, troubles, triumphs, and at least one act of grace. These people would be part of my life forever more. We would help one another through every heartbreak life hurled at us, and want one another to survive and thrive as much as we wanted that for ourselves. We’d have intimate knowledge of one another’s vulnerabilities and never exploit them. We’d show up for every wedding and divorce, go on group vacations, spoil each other’s children, and just generally spit-take the hell out of life together. Instead, at the end of my four years, my fellow students were, for all intents and purposes, strangers to me. I had managed, if you don’t count my boyfriend of two years, to create exactly zero enduring friendships, let alone a magical circle of them. As I waited for my best friend from high school (telling!) to come up and spend “senior week” with me on the emptying campus, I remember wistfully watching groups of tightly-bonded friends getting choked up at their partings, and wondering how I’d become an outsider in the midst of so much intimacy. Was it a personal failure? Was it circumstances? Was it my tendency to yodel when stressed? Was it just the gorgeous meaninglessness of a cookie crumbling? I’ll tell you what it definitely was not: A reason to trouble myself over submitting updates to “Class Notes”. Yet when the sixtieth request hit my inbox today, I stared at it for a good long minute, and then began to type a response. Maybe it was because the request’s wording seemed to telegraph a naked-kitten anxiety about the relevance of “Class Notes” in the shading jungle of social media connectivity. Maybe it was that with every year that passes, I find that the people we have the luck to stand in line with at convenience stores, or count as our friends, or remember even as faint echoes grow more gaspingly beautiful and precious. Maybe because I’m an inveterate look-backer and fool who in general can’t help but pick at the past’s missed or botched opportunities for intimacy. There have been and are kids and dogs, too-soon deaths and undeserved gifts, books read at three in the morning, laziness among geysers, fierce whirring on stationary bicycles, smoke and sweat, thrills and tedium, wasps in the kitchen, kitchens in the sun, and poems lying all over the place to be picked up just for the cost of bending. Plus other stuff. Bills of lading and fool’s errands and such. One leprechaun. I think. But enough about me. I remember so many small odd things about so many of you beautiful souls I had the privilege of at least brushing clumsily up against, if never getting to deeply know. I wish I’d been more able to appreciate and engage with your honey-cut supernumerary charms. It’s my fervent wish that you’re all doing splendidly, by whatever measure is yours. I think it’s a lament. I hope its not a disguised brag. It’s possibly passive agressive. It’s probably an attempt to manipulate affairs so that my e-mail box will flood with messages expressing similar regrets, perhaps featuring me personally, so I can eat them like chocolates. I want it to be a burst of love. But I want a lot of things. delicious. and I’ll say yes…with a small handful of exceptions (and even them I wasn’t good at keeping up with), me too.